Today marks week two of following through on my goal of trying one new vegetarian recipe each week. I feel like a walking advertisement for Pinterest, but it is so easy to find new recipes there. I also enjoy the ease of opening the application at the grocery story to get the recipe ingredients. Gone are the days of scribbling ingredients on paper and forgetting the list home. The recipes are always with me, which increases my chances of trying the new dish. 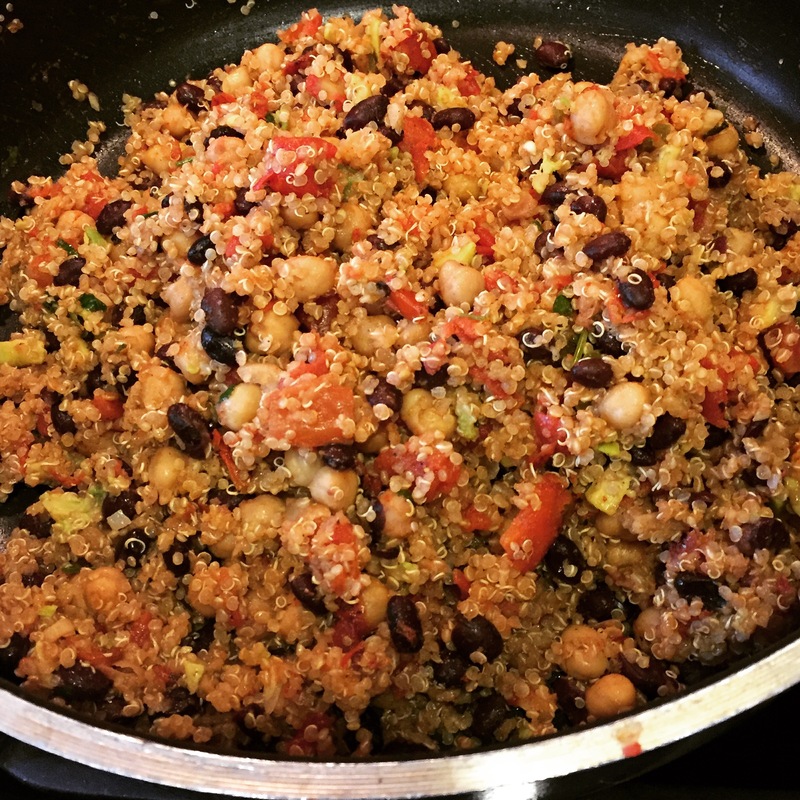 Last week I enjoyed the One Dish Mexican Quinoa so much, that I made it again today. 🙂 This time I substituted chick peas for the corn. It was equally as delicious and the chick peas added even more protein to the dish. I am trying to ease into the vegetarian recipes, so to chose a new one, I look for new ways to combine familiar ingredients. Yes, I am open to try new ingredients but will do so slowly. 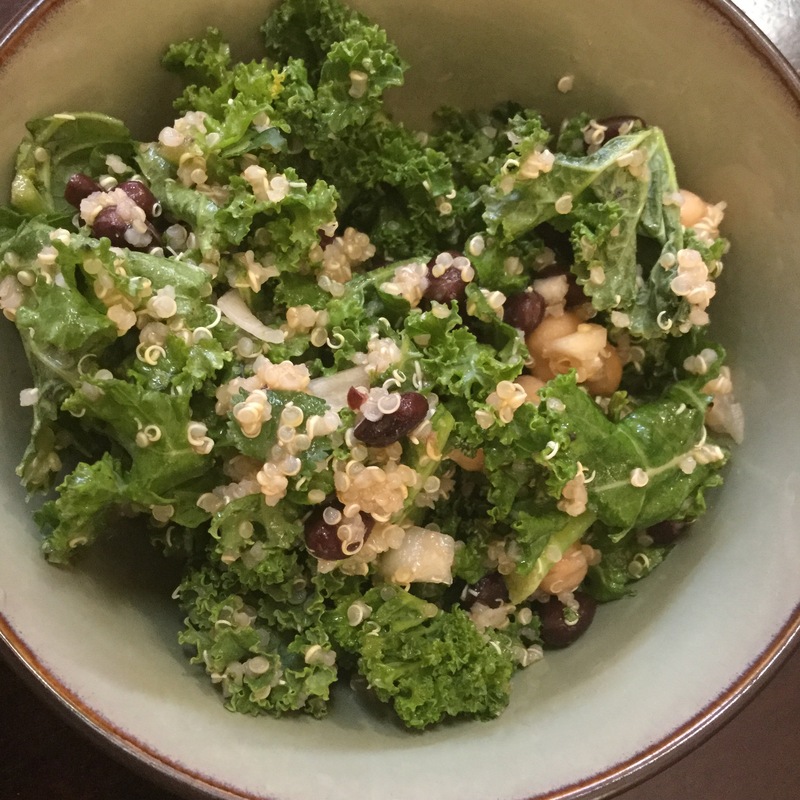 Kale is one of my favorite vegetables, so when I read the Spicy Kale Quinoa Black Bean Salad, it immediately got my attention. First, I love spicy foods. Second, I love kale. The idea of a spicy salad with green veggies is intriguing. Even if you do not consider yourself a cook, you can make this with ease. I substituted the corn with chick peas, so the dish isn’t as colorful but has even more protein. If I am going to eat less or no chicken and turkey, I have to find a way to replace the protein. The above bowl was supposed to be a taste test; however, once I took a forkful, I went back and filled my bowl. Lol!! To make the dish a complete meal, I cooked (broiled) a large piece of salmon. Both my family and I enjoy salmon. Cover and broil on low for 2o minutes. Unconver and increase broiler to high. Cook for approximately 20 minutes. If you are cooking a smaller piece of salmon, it will cook quicker. Keep your eyes on the salmon so it does not over cook. The finished product…. A delightful, light, and nutritious meal. 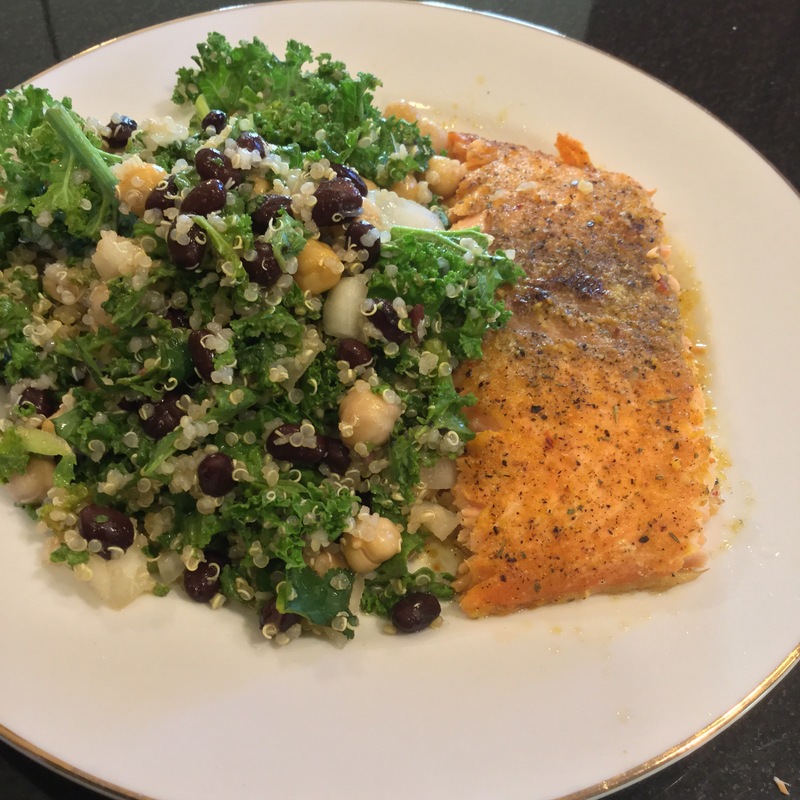 This entry was posted in Healthy Eating, Healthy Living, Inspiration, Uncategorized and tagged food inspiration, kale, Quinoa, Salad, salmon, vegetarian dish. Bookmark the permalink.